Made a few mistakes for this recipe. First of all, I over-estimated my wrapping skills, so there it went a few destroyed hand rolls. Then I used smaller rice paper, which made it even harder to maneuver. There's a saying right? Practice makes perfect. Well, these spring rolls are still far from perfect, but at least they can finally hold up the shape and ready to be munched by hand. Ingredients (makes about 8 to 12 smaller ones)? Mint is preferred, but if you can't get a hold of it, cilantro works as well. Finely chop the mint leaves or cilantro. Julienne half of the cucumber. Rinse and pat dry the lettuce. Peel and devein the shrimps. Bring a pot of water to a boil then quickly cook the shrimps. Drain and wait till the shrimps cool down. Slice the shrimps in half and set aside for later use. 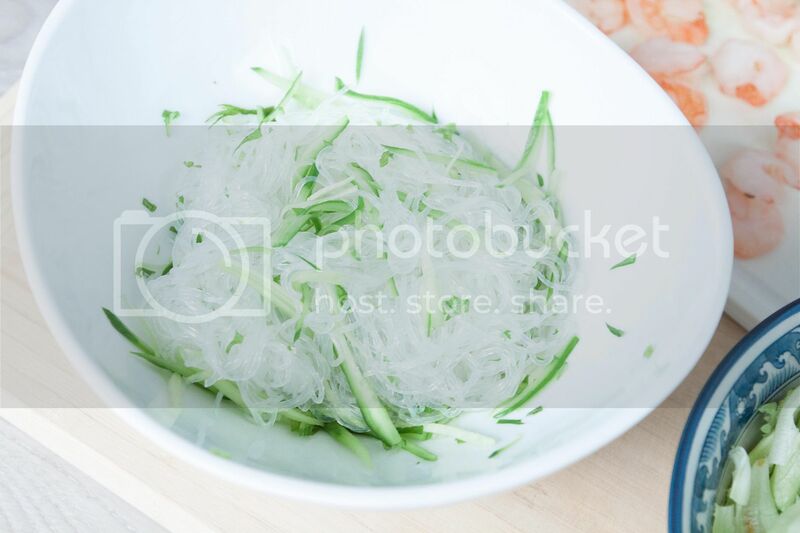 Cook the glass noodles first till desired texture, drain and set aside to cool down. Pour a little oil and mix with the noodles if the noodles tend to stick together. Mix in chopped mint or cilantro leaves along with some julienned cucumber. 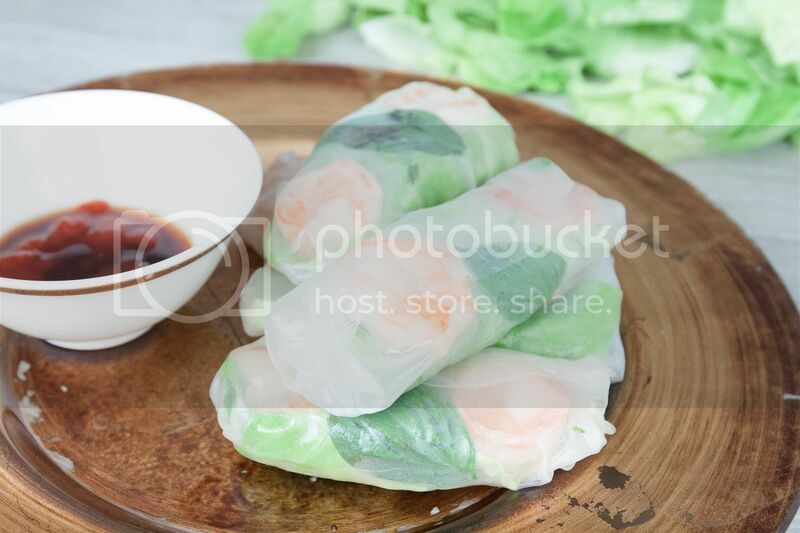 If you never work with Vietnamese rice paper for spring roll before, it's kind of fun! 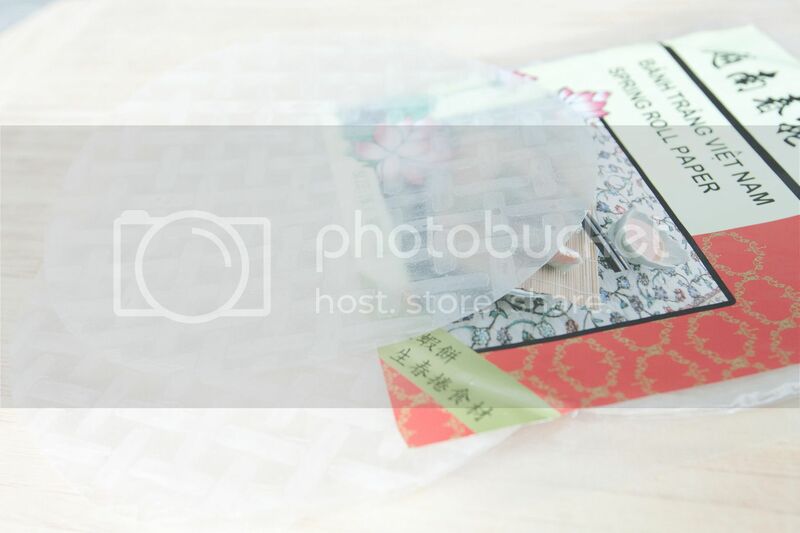 The rice paper might feel like a piece with thin plastic at first, but once soaked in warm water, it'll turn into almost translucent soft wrapper in seconds. Oil the surface where you're going to make the spring rolls. 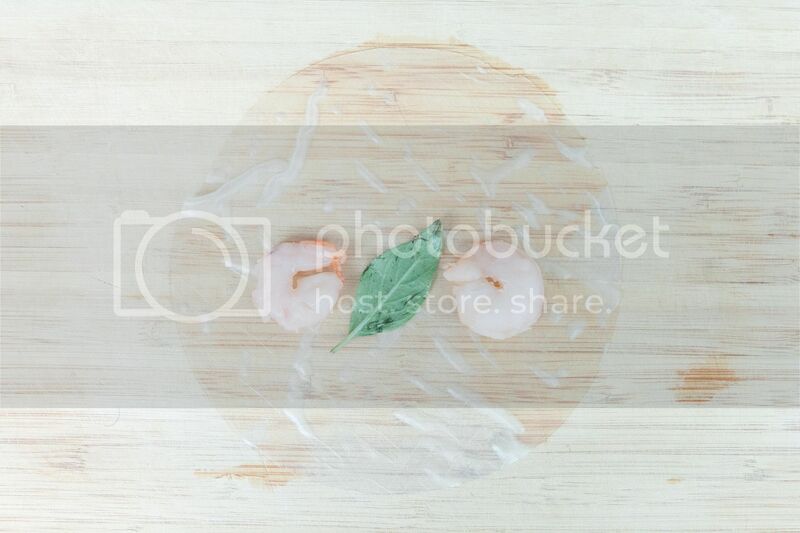 Lay down soft rice paper then transfer halved shrimps and basil leaves on top. Remember the bottom part is going to be the one showing when rolled up, so the prettier sides of these ingredients need to face down. Add one layer of lettuce then transfer some glass noodles mixture over. Start with just a small amount at first in case the filling overflows when rolling up the rice paper. 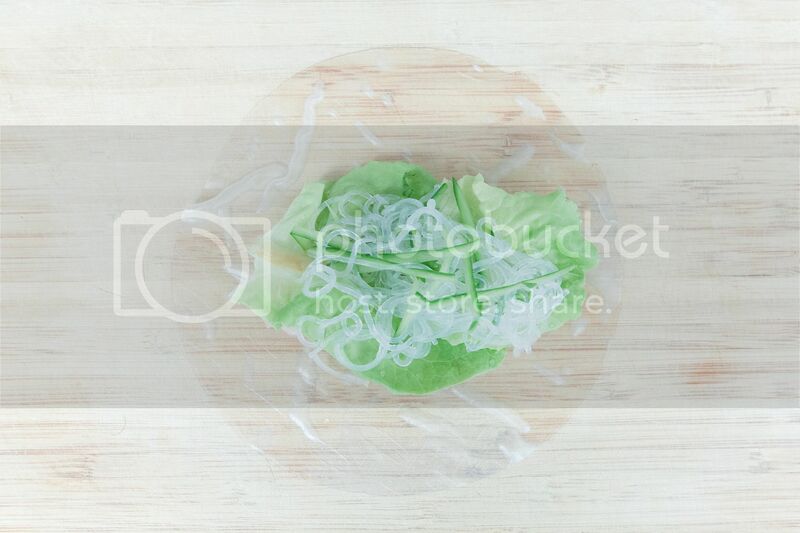 Cover the glass noodles with another layer of lettuce. 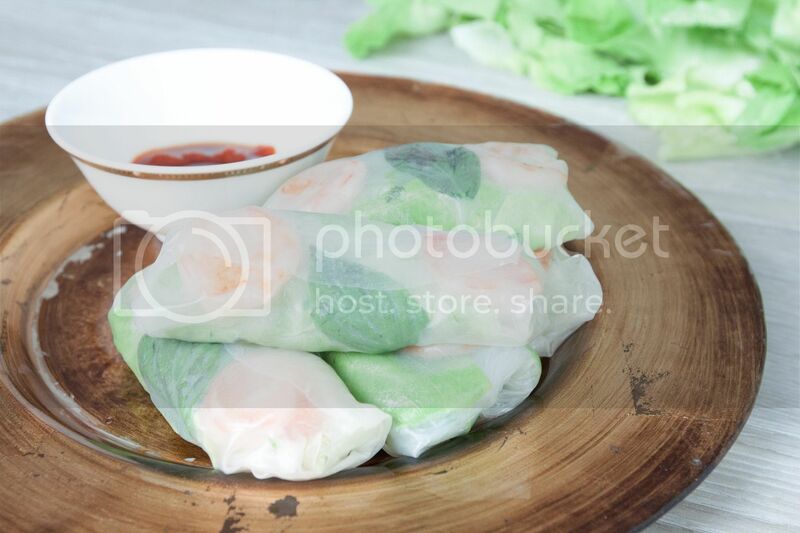 Roll up the rice paper, also fold in both the right and left edges, then continue to roll up the rice paper till it shapes like a small tube. It's nearly impossible to get it perfect on the first try so don't get discouraged when fillings start to fall out or ended up with misshaped spring rolls. Just quickly stuff these not so perfect creations into your mouth to destroy the evidence. 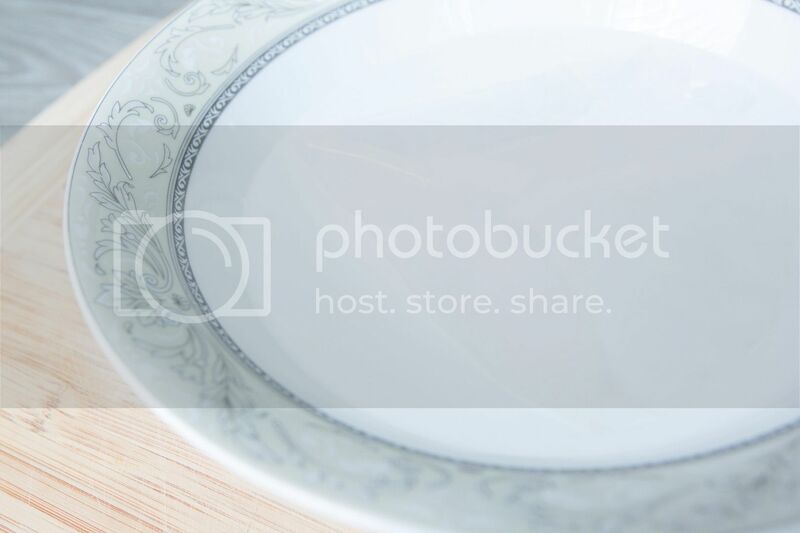 After a few tries, you should be able to get some better looking spring rolls and time to take some pictures! As for the dipping sauce, simply mix all the ingredients under the sauce section. Make sure the sugar is full dissolved, you can also substitute fresh chilies with Sriracha. The one showing in these pictures are the mixture of some hoisin sauce, Sriracha, etc. Frankly speaking, I was frustrated from rolling up these finger food and got a little lazy on the sauce. On top of the actual dipping sauce and my lazy dipping sauce, some like their spring rolls with creamy peanut sauce, but let's keep it simple first, till we master the art of Vietnamese spring roll making.